Science Supplements WellHorse is a range of feed and forage balancers for the leisure, performance and veteran horse. Horses nutritional requirements differ, especially as they get older or are in increased work. The domesticated horse is also usually deprived of the correct amount of nutrients as we remove them from their natural habitat. 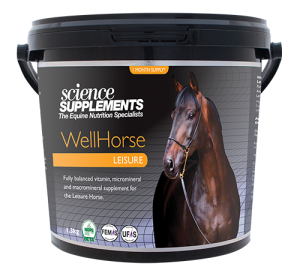 The WellHorse range supports your horses needs to maintain a fit, healthy and active life. The right balance for your horse. The WellHorse range is fully balanced and also supports your horses joints, gut and immune system and is the only balancer that meets the vitamin and mineral requirements as recommended by the NRC (National Research Council) and BASF (Animal Nutrition). So whether you have a leisure horse, performance horse or veteran, you can trust WellHorse to give you the support you need. For detailed information and feeduing guide click on the individual products below.